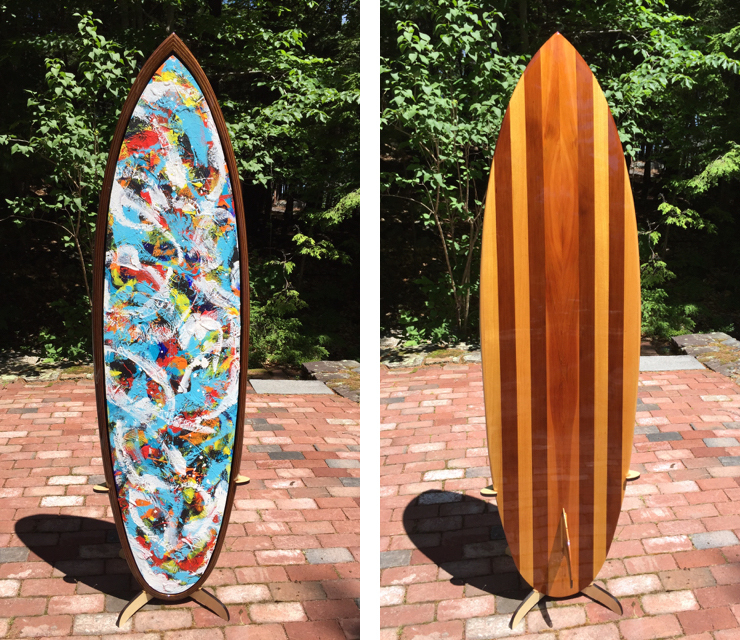 It is with great gratitude, profound pleasure, and a bit of personal pride, that I introduce “Pelagic Pulses;” a hand-made wooden surfboard sculpture with an original painting by Imogene Drummond. 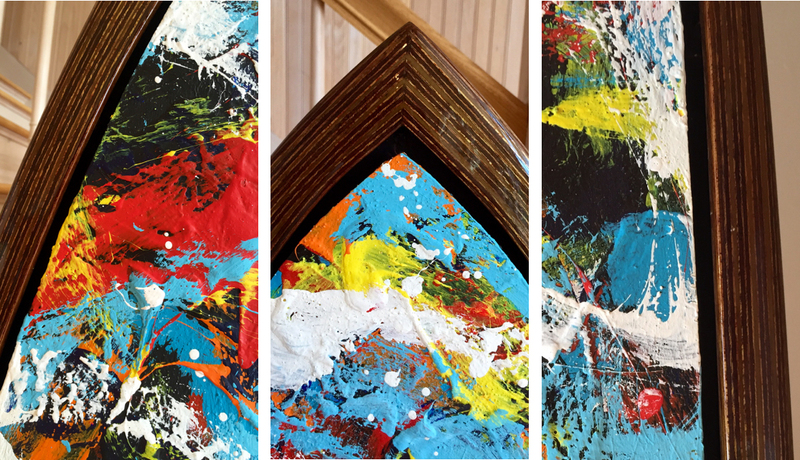 Proceeds from the sale of this artwork will support the Surfer’s Guide to the Universe. Your support will help fund this exciting worthwhile environmental educational project. It is fundamental that patterns, people, and even ideas are natural emergent properties of the cosmic chaos. Our deepest thoughts and the creations they propagate are, in fact, embodiments of the universe. We are in the cosmos. That much is clear. But the cosmos is also in us: in our heads, our hands, and our hearts. “Pelagic Pulses” captures this reality and the many essences of surfing through the diverse and colorful world we call Nature. 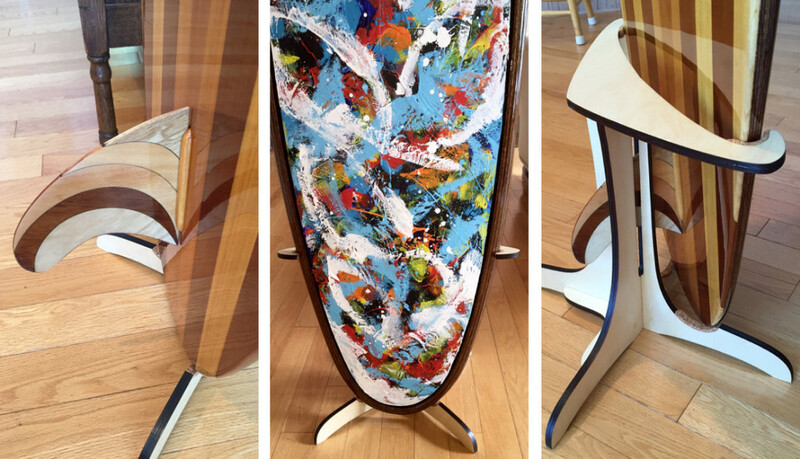 This four-dimensional sculpture is the culmination of over two decades of wooden surfboard design, ride, creation and evolution, now in collaboration with striking artistic expressions in paint. While the warm wood-tones and gentle curves arching across one side invoke a sense of control and refinement, the abstract splashes of color on the other side provoke feelings commensurate with the exuberant complexity of the cosmos. The project as a whole, and the artwork emanating from it, explore the artists’ ongoing conversations between art and science, narrative and light, color and cosmos. While one side of “Pelagic Pulses” is defined by the science of wave-riding, the other side manifests art through bold and expressive brushstrokes. Whereas one side conveys carefully thought craftsmanship with meticulous attention to hydrodynamic function, the other is wildly free, impulsive and vibrant. 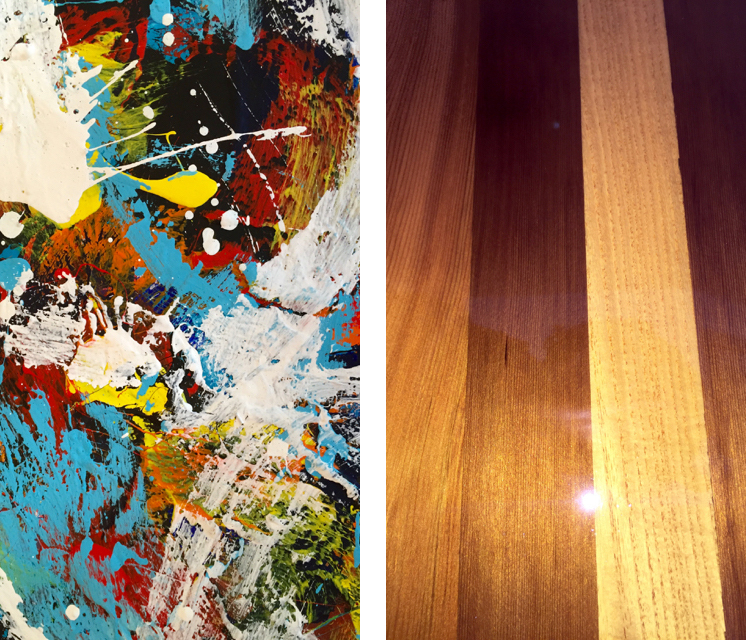 Whereas one surface is polished, perfect and smooth, the other is textured, alive, and fecund. And between these two paradigms I have placed a bold, black, border to represent the divide between science and art. It is a boundary that seems to be continually challenging me in my academic and professional work, and personal outlook. As this divide often presents struggle and risk in my own life, I have made this boundary wide and divisive to convey its significance both as a personal and cultural divide. But upon closer examination one hopefully discovers that this border is not real. It is in fact, empty space. Thus, the perceived boundary is not a boundary at all. The rift between art and science is essentially, nothing. This purely conventional divorce between nature and mind, is simply the result of outmoded perceptions, politics, and ideologies. The dualism is merely historical and the unchallenged schisms have now led us into the uncertainty of Anthropocene. But they needn’t be permanent. Breaking the illusory rift between art and science, I assert, also rings true for nature and spirit; heart and mind; self and other. And exercising this practice in daily life can evoke a new ecological perspective akin to that experienced by astronauts who have viewed the Earth from the surface of the moon. This is a perspective conveyed by the gradations of wood in the surfboard’s fin. A full appreciation of the emergent properties of the melding of art and science requires an open heart, a fertile mind, and a clear 360-degree view. Mounting “Pelagic Pulses” on a wall, then, it seems, would betray this idea and miss the opportunity it contains. Thus, the artwork includes a custom-designed, freestanding, vertical mount in order to fully engage with the concept of personal-cosmic reconnection. 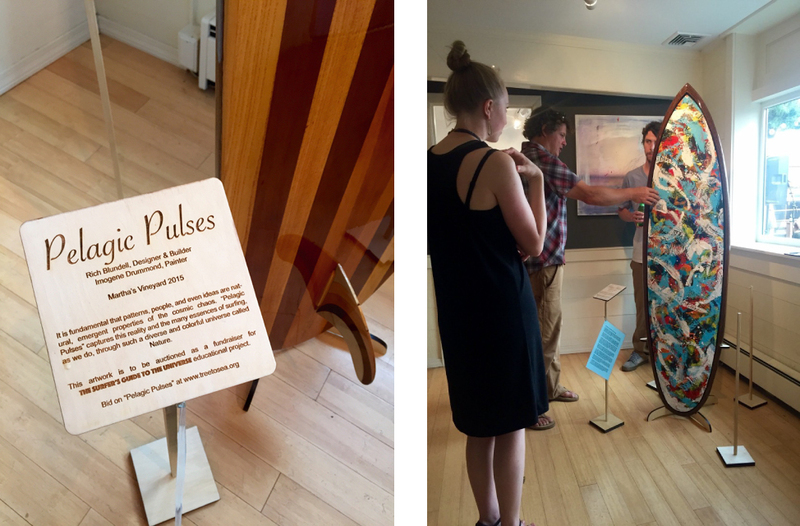 “Pelagic Pulses” is currently showing at The Workshop Gallery in Vineyard Haven, Martha’s Vineyard: a place owned, inspired, and run by working artists. The origination of “Pelagic Pulses” is the island of Martha’s Vineyard. The board was built at the renowned Gannon and Benjamin Marine Railway. She is made primarily out of of sustainably grown and harvested wood, glass, and adhesives. There are no metal or plastic fasteners of any type. The internal “fishbone” framework, painted panel, and rails are made from marine-grade Sapele and Meranti plywoods. The planks and fin alternate between Western Red cedar, Atlantic White Cedar, and Asian Paulownia protected by 10 coats of mineral spirits and pure Tung oil. The vertical stand is made from Baltic Birch and includes an integral fin-slot to accommodate secure, reversible display. The auctioning of “Pelagic Pulses” is part of a fundraising campaign to support the development of an environmental education project called the Surfer’s Guide to the Universe. The Surfer’s Guide to the Universe is an invitation for all people, but especially the young at heart and mind, to personally engage with the awesome reality of our cosmic story. The goal is a new, personal integration of the cosmos into consciousness and the lived-experience of daily life. The Surfer’s Guide to the Universe will include a popular book, a website and broadcast digital content, in-school educational programs, a public lecture series, and a documentary film. The core content of the “Surfer’s Guide” is the scientific and cultural narrative of humans as emergent of the cosmos. This means the Surfer’s Guide taps the most rigorous scientific knowledge and collective wisdom from all aspects of the human endeavor. So, while the Surfer’s Guide may have a rather laid-back, fun, surfer’s style, it is firmly committed to current scientific knowledge. It is from this knowledge that new wisdom and personal meaning can be found. Living, as we are, on this small, improbable, stunningly beautiful, planet – home to a complex, and intricately interwoven web of life, the Surfer’s Guide to the Universe aims to remind us of this reality. The message is enthusiastic, encouraging, and empowering. It aims to cultivate a new relationship with the world. The Surfer’s Guide to the Universe is also meant to antidote much of our current culture of material consumption, which is seen as impoverished of personal meaning, often dissatisfying, and leading us into an unfulfilling, and ultimately unsustainable way of life. Instead the Surfer’s Guide to the Universe proposes bigger, better, and more natural personal and cultural narratives. This is the core educational mission of Rich Blundell and the Surfer’s Guide to the Universe project. 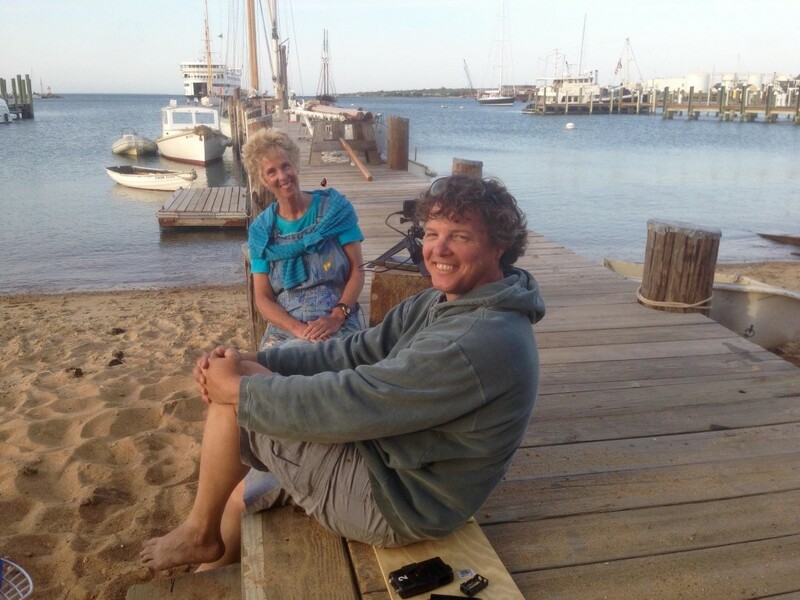 Rich Blundell was raised on a small, family-owned, farm in Southeastern Massachusetts. He credits his experience with farm animals and work with forming his deep sensitivity toward living things and nature. For several years he was a commercial fisherman, that is, until an 800-pound Bluefin tuna which he had caught changed his path. That experience set him on two decades of marine and terrestrial adventures around the globe from East and Central Africa, South and Central America, the Caribbean and, most recently, Australia. He has committed his life to communicating the soaring central revelation of the natural sciences: our physical and spiritual oneness with the cosmos. 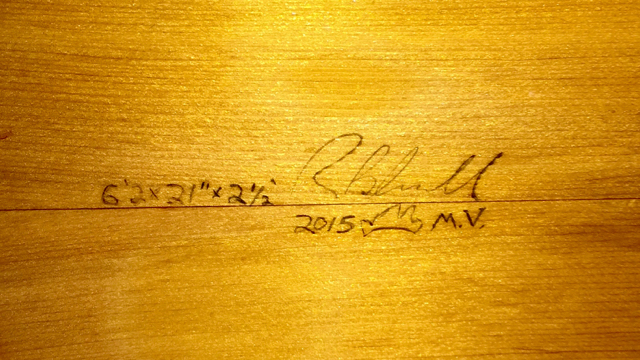 Rich is also an avid surfer and builder of his own hollow wooden surfboards. As the inventor of an innovative construction technique, his surfboard designs and building method are responsible for thousands of wooden surfboards now surfing the world’s oceans. Rich Holds a B.Sc. in geology and marine science, an Ed.M. in science communication, and has recently submitted his Ph.D. in Big History (aka cosmic evolution). His doctoral research explores the personal and cultural transformative power of engaging with the scientific cosmic narrative and how that transformation can help ameliorate the Anthropocene. In short, Rich studies the phenomenology of nature. Imogene sees nature’s colors, shapes and fractal patterns and applies the colors of light, not just pigments to the canvas. In this way, I believe she captures an elemental beauty and vitality of life. In “Pelagic Pulses,” as in all of her paintings, she has flung many layers of paint to build up a thick, textured surface. These textures, still visible on the painting’s surface, tell the story of her creative process. Like beds of fossils beneath the surface, they record an earlier life of the painting, and provide a sub-textual history of emotions and feelings. The imagery of Imogene’s work has developed through a lifetime painting expeditions around the world. It is through such adventurous travel and painting practice that she was invited to become a member of the esteemed Society of Woman Geographers. More of Imogene’s work can be engaged on her website. This entry was posted in Auction and tagged Art, auction, hws, Rich Blundell, Surfers Guide to the Universe, wooden sculpture. Bookmark the permalink.